How to count text on websites? There are two ways to count Web-sites in AnyCount. 1. Download the website you need to count words on. 3. Add the pages you need to count. 4. Click the Count! button. You will see statistics for each page and the total amount of text. 1. Click Files >> Add from Web. 2. Enter the address of the web-site you want to count, set the depth limit (The number of "levels" of links the program will follow, downloading every page and file along the way for counting). Keep in mind that the program will not be able to download pages that require authentication (login and password or similar) to enter in this way. 3. 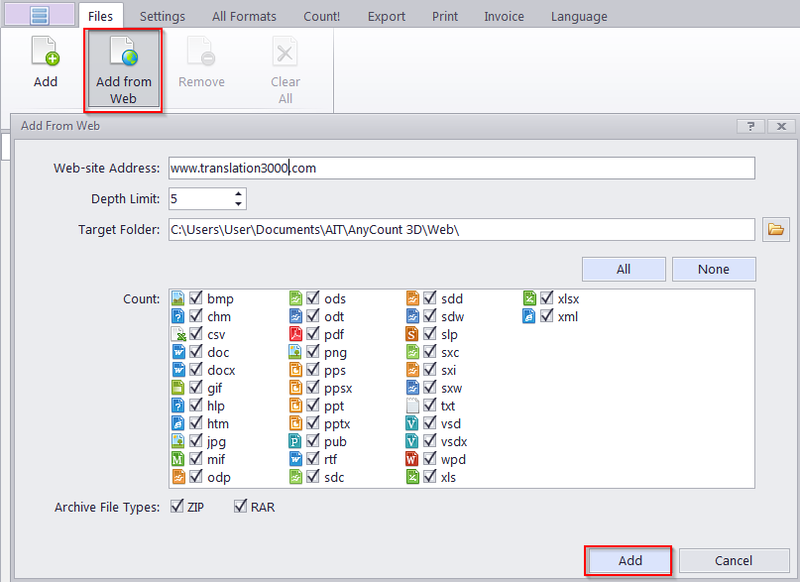 Select the folder into which the found pages will be added and the formats of files the program will select for counting. 4. Click Add to begin the download. 5. Once all the required files are downloaded, click the Count! button.